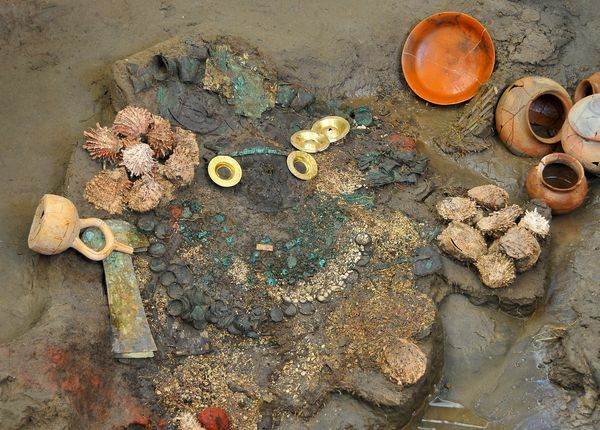 Chotuna-Chornancap (Pérou): Ancient Tomb Built to Flood—Sheds Light on Peru Water Cult? The stacked tomb sits in a sprawling ceremonial complex called Chotuna-Chornancap, close to the modern city of Chiclayo. The spiritual center's coastal location, water-themed art, and recently discovered grave may help round out the creation story of the Lambayeque. According to folklore, their mythical founder, Naymlap, arrived on a raft from the sea and walked on crushed Spondylus shells—a ritual item treasured throughout the Andes. When he died he turned into a bird. "These concepts—birds and water—are part of their beliefs and help them understand life and death," dig leader Wester La Torre said. They knew the tomb—located below the water table, where the ground is always saturated—would flood, Wester La Torre said. They likely wanted it to flood, he added, perhaps to ensure the region's agricultural fertility. 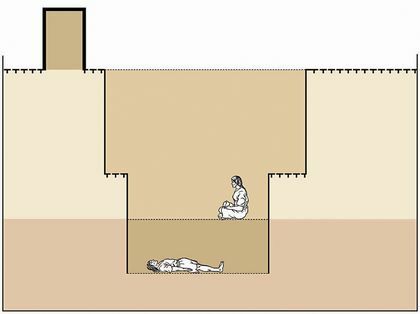 The practice of a groundwater burial could also link the Lambayeque to that later Andean culture, the Inca, Wester La Torre said. "The Inca believed that the dead became a seed, which sprouted new life," he explained. "The way that this person was buried suggests the same process of fertilization, in which the seed, the person, is reborn." "What we don't really know is the water table 800 years ago," says Southern Illinois University's Shimada. "We don't know where it was." Regardless of water levels, Shimada said, "the single most important aspect of this superimposed tomb is that both [burials] date to a time period that is still not well known. It is one of the very few elite tombs dating to the Late Sicán." The disasters launched the culture into a "period of chaos and decline," Shimada said. The capital moved to a new location, and the civilization entered its late period. Although the Lambayeque's territory shrank, their society remained a power in the region, archaeologists say—and the new tomb discovery appears to back them up. "The tomb suggests that, indeed, shortly after the series of natural disasters ... ," Shimada said, "they maintained a great deal of wealth." Alia Isabel Puig translated Carlos Wester La Torre's interview.